There are currently no explicit, comprehensive statewide laws establishing LGBTQ non-discrimination in Alaska. Public employees in Alaska are protected from employment discrimination based on sexual orientation, via a 2002 executive order. On April 3, 2018 the city of Anchorage will vote on a ballot initiative that could repeal key non-discrimination protections for transgender people. An ordinance granting protections from discrimination based on sexual orientation and gender identity was passed by the Anchorage Assembly on September 29, 2015. The ordinance is the first of its kind in Alaska and follows a decades-long conversation about LGBT people in the state. 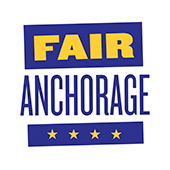 Fair Anchorage is a bipartisan, grassroots coalition working to defend non-discrimination protections for transgender people in Anchorage and defeat the discriminatory Proposition 1, which would bring discrimination back to Anchorage by repealing the city’s non-discrimination laws. January 1, 1976: The Anchorage Assembly passes a local ordinance protecting residents from discrimination based on sexual orientation. The ordinance is vetoed by Mayor George Sullivan. In 1992, a similar ordinance is passed and again vetoed by Mayor Tom Fink. 1976-2011: Local and national organizations engage in conversations about who LGBT Alaskans are, and support for fully comprehensive non-discrimination grows. Over the years, legislation denoting “sexual orientation” as a protected class is proposed as amendments to bills, only to be later removed. March 5, 2002: Alaska Gov. Tony Knowles signs an executive order prohibiting discrimination based on sexual orientation in state employment. August 11, 2009: The Anchorage Assembly passes a local ordinance extending protections from discrimination based on sexual orientation. Mayor Dan Sullivan, the son of 1976 mayor George Sullivan, again vetoes the ordinance. April 4, 2012: Despite strong organizing from supporters of non-discrimination, LGBT opponents at the ballot reject a proposed non-discrimination ordinance in Anchorage. September 29, 2015: The Anchorage Assembly passes a local non-discrimination ordinance extending protections from discrimination based on sexual orientation and gender identity. The ordinance is the first of its kind in Alaska. August 24, 2016: Lawmakers in Juneau approve an LGBTQ-inclusive non-discrimination ordinance. July 27, 2017: An anti-transgender ballot initiative backed by Alaska Family Council President Jim Minnery is tentatively certified by the Anchorage Municipal Clerk to be placed on Anchorage’s mayoral election ballot on April 3, 2018. April 3, 2018: Fair Anchorage is leading the fight to defeat Proposition 1 and defend transgender-inclusive non-discrimination protections in Anchorage, which will be put to a vote on April 3. A March 2002 executive order signed by Alaska Governor Tony Knowles prohibits discrimination based on sexual orientation in state employment. A national 2011 poll found that 79% of respondents from Alaska support a nationwide law prohibiting employment discrimination based on sexual orientation and gender identity.